On Monday 1,500 New Yorkers marched through Albany to tell Gov. Cuomo one simple message: Don’t Frack New York. Cuomo is preparing to making a decision about the future of hydraulic fracturing for gas in New York. He says he hasn’t made up his mind, but he’s also overseen a flawed environmental review process, lead by a climate denier, that papered over the real risks of fracking. So on Monday, 1,500 New Yorkers rumbled through Albany to remind Gov. Cuomo of the environmental, health – and political – risks of allowing our communities to be fracked. If you couldn’t make it on Monday, the most important way to show your support for the action is to call Governor Cuomo and tell him that you stand with the folks who took action earlier this week. We had an impressive crowd, but if Gov. Cuomo knows that there are even more folks waiting in the wings ready to take action, then it will be even tougher for him to move forward with a plan to drill. Can you call Gov. Cuomo now to tell him ‘don’t frack New York’? A Letter to the Editor (LTE) is a short opinion-oriented statement that you submit to your local newspaper. Instructions: LTEs should be fewer than 250 words, the shorter the better. If you can relate it to a recent story or current event, the likelihood of getting it published increases. Both mobilizing for Don’t Frack NY and signing the Pledge to Resist Fracking in New York are good hooks (something new, a current event) for your letter. If there is a recent story in your paper about fracking and you can relate your letter to that story, that is also a good strategy. You should not try to cover everything in your letter, but rather focus it on one or at most two points. Submitting your LTE: Go to your local paper’s website and do a quick search for “letters,” “opinions,” “editorials” or “letters to the editor” and you should find a page with either an in-the-browser form to submit your LTE or an email address to which you can send it. A follow-up call to your paper (ask for the editorial/opinion desk or editor) before or after submitting your LTE will greatly increase the likelihood that it gets published. If you can’t figure this out, feel free to contact John Armstrong at john@frackaction.com or 607-220-4632. 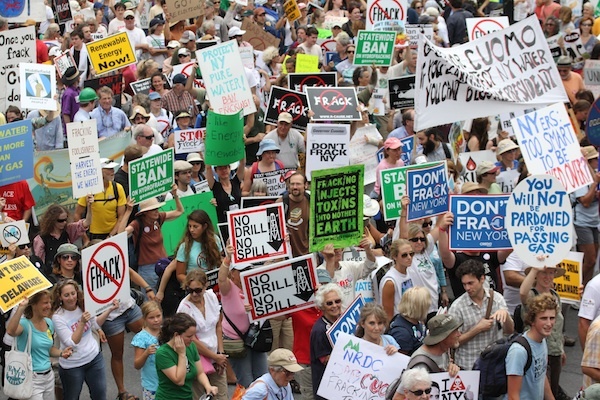 I am proud to have joined with more than 1,500 New Yorkers at Don’t Frack New York on August 27 who marched from the glistening Hudson River, through the streets of Albany, to our State Capitol to tell Governor Cuomo: listen to the science, ban fracking! We delivered that message with a powerful new PLEDGE TO RESIST FRACKING IN NEW YORK, a solemn but strong personal commitment to take action to stop the environmental and public health disaster that fracking would bring to our communities. The gas industry wants to pretend that everyone opposed to fracking as radical and emotional, but it is the science, that drives us to take action. It is fact that well casings are destined to fail, a fact that fracking destroys air quality and covers communities in carcinogenic silica dust, and the science that shows methane leaks from fracking spell disaster for the climate. All of these things have been confirmed by hundreds of doctors, independent scientists, and medical organizations. Given the Department of Environmental Conservation’s grossly inadequate and flawed study and review of fracking, only one emotion t would lead Governor Cuomo to give fracking the green light: greed. Specifically, the greed of the oil and gas industry that has already spent millions to influence Albany. Greed is an emotion — and one that must not be allowed to dictate the future of New York State. Join over 3,000 New Yorkers in signing the pledge at www.DontFrackNY.org. We suggest that your LTE introduce the Pledge to Resist Fracking in New York and use that as the introduction for a compelling reason why you have signed the pledge. The following list provides many such compelling reasons. Remember, you want to focus on one point, not try to cover everything. The more personal you can make it, the better. · The community impacts of fracking are unacceptable. New Yorkers will not let our schools and daycare centers be covered in carcinogenic silica dust, have our children grow up in communities with increased crime rates, have our communities paved through with spider webs of well pads, access roads, pipelines, and unending noise that is akin to an airport runway. · Independent scientists and science have demonstrated that fracking cannot be done safely. The DEC’s review is grossly inadequate and flawed and offers Governor Cuomo no ground on which to say that fracking can be done without jeopardizing the health and wellbeing of New Yorkers. · Governor Cuomo has said that “all watersheds are sacrosanct.” I wholeheartedly agree, and ask how it is that he can say that fracking is too dangerous for the NYC and Syracuse watersheds but not for my water source and my community? · *Especially for NYC* How is it that NYC Mayor Michael Bloomberg can say no way to fracking in the NYC watershed but give millions of dollars to frack anywhere else? If it’s too dangerous for NYC, it’s too dangerous for everyone. · Fracking threatens to cause precipitous drops in home values, undermining the financial stability of my (/many) family(s). · Reduction of property values may cause a reduction in our local tax base. · The grassroots opposition to fracking is the greatest grassroots movement in New York’s history, and it will only grow exponentially in size and commitment if fracking is given the green light. · Independent economic studies show that areas that have hosted extractive industries are worse off when the industry moves on. · Nationwide Insurance recently stated that fracking and associated activities are too risky. · The American Nurses Association has called for a national moratorium on fracking permits on the premise that the health concerns have not been studied and addressed. That included New York, where no health impact assessment has been done even though hundreds of doctors and medical organizations have called for it. · New York has the opportunity to become a national leader in renewable energy, but investment in fracking and accompanying infrastructure would crowd it out. · In this time of terrible drought, fracking stands to greatly exacerbate climate change due to the release of methane, an extremely potent greenhouse gas. · Dangerously high levels of radon – the #1 cause of lung cancer among non-smokers – in the Marcellus Shale threaten to put New Yorkers across the state at risk of lung cancer right in our own homes as radon spews out of our kitchen stoves. · Fracking would wreak havoc on our air quality, just as it has done across the country such as in mountainous areas of Wyoming that went from pure mountain air to air worse than downtown LA in just a few short years of fracking development. You do not have to be an expert on any fracking-related topic – simply speak to your concerns. Press Hits for Don’t Frack New York! Comments Off on Press Hits for Don’t Frack New York! WHAT: March and rally with street theatre, huge signs and visuals, and a giant Governor Cuomo prop. WHY: The broad anti-fracking movement in New York State is unifying around a powerful new “Pledge to Resist Fracking in New York” following signals that Governor Cuomo is considering releasing final fracking regulations and lifting New York’s moratorium. On Monday August 27 citizens from across New York will be speaking with one voice to make our deep commitment to stopping fracking clear. The purpose of Don’t Frack New York is to deliver our pledges of resistance to Governor Cuomo and demand a ban on fracking. The pledge lays out that stopping fracking is necessary to prevent the destruction and poisoning of New York’s water, air, and food systems on which life, health, and economic prosperity all depend — including that of future generations. For more information, see www.DontFrackNY.org. You know us as a documentary filmmaker and a science writer. Together and separately, we’ve worked for the past three years to investigate the horror show that is hydraulic fracking. In both images and words, we’ve documented the irremediable threats that fracking poses to public health, to our air, food, and water systems, to a vibrant economy, and to a sustainable future. We’ve unearthed industry documents, brought science to public hearings, traveled to fracked communities across the nation, and interviewed terrorized people. We’ve stood next to pits full of poisonous frack waste. We’ve seen the earth turned inside out for the strip-mining of frack sand. We’ve been run off the road by fracking trucks. We’ve researched, analyzed, compiled, debated, and testified. We’ve confronted trade secrets, medical gag orders, and non-disclosure agreements. And what we (and others) have reported is deeply troubling. Well casings leak. Air fills with benzene, silica dust, and smog. Drill cuttings are radioactive. Water becomes flammable. And most alarming: people in other states who live near drilling and fracking operations—and their animals—are getting sick. If facts and information truly formed the basis of Governor Cuomo’s upcoming decision to maintain or lift our state’s current moratorium on shale gas fracking, our work would be done. But it’s not. And it isn’t. The comprehensive review on fracking that the governor ordered the Department of Environmental Conservation to compile is a deeply flawed document that was crafted under the influence of the gas industry. It is less science than infomercial. And the DEC official responsible for its accuracy, Bradley J. Field, is an avowed climate change denier. Nevertheless, and over the repeated objections of elected officials, physicians, independent scientists, and thousands of concerned citizens, the governor appears poised to move forward with fracking. At the same time, with the might of the gas industry pushing him relentlessly to take that that treacherous step, he has not done so yet. Indeed, he’s been careful to leave an exit door open. All of us together—with love, science, and no-surrender determination—can help direct Governor Cuomo to the exit. All together, we can still make fracking a political impossibility in New York State. At this perilous moment, the Governor needs to hear from the people like never before. And that’s why we are writing to you. We are asking for two big things. First, join more than 1,300 other New Yorkers and sign the Pledge to Resist Fracking in New York State: http://www.dontfrackny.org/pledge/. This proclamation expresses unalterable opposition to fracking in New York and a solemn commitment to nonviolent protest should the Governor approve it anywhere in our state. Second, get on the bus. Join us on Monday, August 27 as multitudes of concerned people convene in Albany for a historic day called Don’t Frack New York. Speaking with one voice, we’ll deliver our pledges of resistance to Governor Cuomo and demand a ban on fracking. There will be street theater, music, inspiring speeches, a rally, and a march. Award-winning writer and 350.org founder Bill McKibben will be there with us. And for those who can, we invite you arrive in Albany two days prior, on August 25 and 26, for a weekend of trainings and strategy discussions that will precede Monday’s mass mobilization. We do not lightly call our fellow New Yorkers from their families, homes, jobs, and summer vacations, for the hard, slogging work of political action. We ourselves would rather be making movies or writing books. But each one of us—like a lot of you—has come to believe that a defining moment has arrived: we now must all stand together or, assuredly, we shall all be fracked separately. Out of this belief, each of us is donating $1,500 from our respective personal emergency funds to help underwrite the cost of this event. If you are so led, you can contribute as well—this webpage makes it easy—but what we are really writing to ask for is not your money but your time, voice, and resolve to protect this beautiful state and the people who live here. We are asking for the courage of your convictions. Consider the pledge. Consider Albany on August 27. To tell Gov. Cuomo that we won’t allow New York State to be fracked by the oil and gas industry. Location and other details to be announced shortly. See you in DC, and then in New York. (c) 2019 Don't Frack New York | powered by	WordPress. Paid for by 350.org Action Fund.